A Hand-out to give friends and family. An immediate mailer/invitation. There’s no envelope to open. A good-looking ‘small flyer’ for us, fellow artist friends, and student volunteers to leave at coffee shops and to pin on announcement boards at museums, cultural organizations, and student centers, etc. 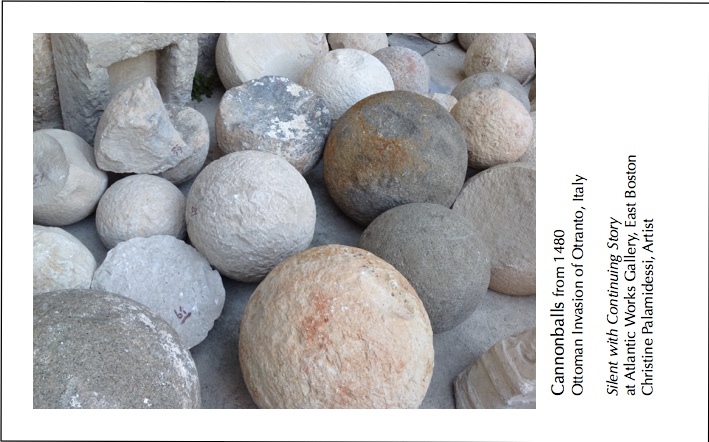 A calling card for when we visit galleries this month. A possible bookmark and legacy stash. 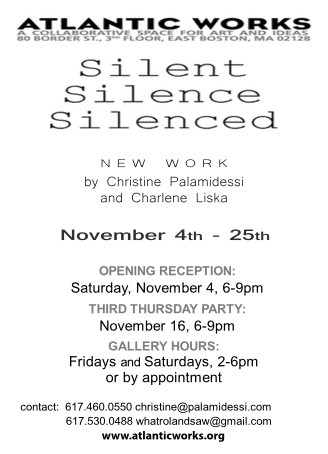 Front of Charlene Liska’s postcard for Silent. Silence. Silenced. Decisions to make before designing an Art Exhibit Post Card. What’s on the Front? Usually an image. Could be words. What Goes on the Back? Who-What-When-Where ( more later). Size. To qualify for First-Class Mail postcard rate the card has to be rectangular, at least 3-1/2 inches high x 5 inches long x 0.007 inch thick and be no more than 4-1/4 inches high x 6 inches long x 0.016 inches thick. Print Run. How many to print? Budget. How much money you have to spend on this aspect of promotion//marketing? As far as print run: we decided to print 500 postcards and print two different front images. We shared identical print information on the back of the post card and varied the image on the front 250/250. Front of Christine Palamidessi post card for Silent. Silence. Silenced. Plan ahead. Have the postcards ready 1-2 months before your show opens. This means not only do you need to design the card, but communicate with your printer to find out his/her lead time. So work backwards from your desired date of having the post-card in hand and then line up all the things you need to do to make it happen. Who. What. When and Where. Yes, you’ve heard this before and you’ll hear it again. Who (your name) What (name of show and definition of show–is it a pop-up, a month-longshow, a one nighter?) When (the run date of the show as well as the date of the Opening Night and any other special events during the run of the show) Where (name of the gallery, or venue, and the address. Include zip code and phone number of the gallery and the gallery/venue website. You may consider putting your own phone number on the card, as Charlene and I did, but realize your phone number may end up on someone’s solicitation list. Establish Credibility. Be sure to proofread everything. Use high resolution photos/jpg. A sloppy looking card communicates ‘a don’t care/don’t know/I make mistakes attitude’ — which you probably don’t want to do unless that’s the theme of your exhibit, which has its own set of decisions and contradictions not addressed here. Ask Friends and Art Community to Help Spread the Word & Distribute Your Post Cards (drop off, mail, post in their place of work) .